The English High Court rejected the claimant’s use of econometrics to quantify damages in BritNed v. ABB. The approach was described by the court as ‘too complex, ‘unspecific’ and inconsistent with the documentary evidence. Specifically the average overcharge estimated by the statistical analysis was seen as inappropriate for a specific cartel project; a project that the court found had been competitively priced. The judgment indicates some of the factors that will need to be taken into account when econometric evidence is used in the courtroom. BritNed v. ABB is the first English cartel damages judgment, and the first to consider margin, cost and econometric approaches to the quantification of damages. It also adopts an unusual approach to the quantification of damages for a bid rigging cartel. This Casenote examines the Court’s cost-based approach and concludes that the award of damages for common cost savings was misconceived. The Court espoused the unusual position that while the claimant did not suffer this ‘loss’ it nonetheless should be compensated because other customers of the defendant had not shared in the profits from its illegal behaviour. This collective notion of average loss, or rather cartel profit-sharing, violates the basic principles of compensatory damages. An expanded version of the Casenote has been published in Journal of European Competition Law & Practice in 2019. Mrs Justice Rose, a judge of the English High Court with considerable experience of competition law, recently predicted that behavioural economics has ‘a bright future in competition law litigation.’ This Casenote takes a critical look at the three competition judgments she highlighted in support of her ‘prediction’ – Enron v. EWS Railway, Flynn Pharma & Pfizer v. CMA and Streetmap v. Google. The discussion fails to find any support for the view that the courts would have been assisted by behavioural economics. 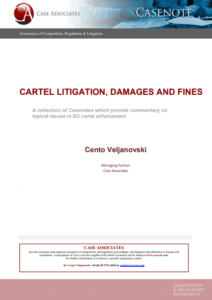 The Casenote was published in the European Competition Law Journal in early 2019. This Casenote takes a critical look at the English Court of Appeal decision on three conflicting judgments on whether Mastercard’s and Visa’s default multilateral interchange fees (MIFs) infringed Article 101TFEU. The Court of Appeal rejected much of the contradictory reasoning of the High Court and Competition Appeal Tribunal (CAT) to effectively reinstated the European Commission’s MasterCard Decision that the default MIF was illegal. The Court of Appeal was highly critical of the lowers court’s reasoning but leaves open the question of how merchants can negotiate interchange fees. A expanded version will be published in Competition Law Insights. Our March Casenote reviews the European Commission’s cartel enforcement activities during 2017. There was a reduction in the number of published decisions and aggregate fines with an almost exclusive focus on the automotive sector. The Commission exceptionally prosecuted a buyers’ cartel (Car battery recycling) and dawn raided another (Ethylene). Is the government trying to protect HS2 from competition? In our November Casenote David Starkie highlights the intention of the Government to merge the West Coast Main Line rail franchise with HS2. He suggests that the object might be to suppress a competitive challenge to future services operating on this controversial stretch of infrastructure. To support his argument he finds a ‘smoking gun’: a report by HS2 Ltd’s consultants highlighting the threat from other rail services and that Government policy on franchising would greatly influence HS2′s competitive environment. There was a considerable slowdown in the European Commission’s cartel enforcement activities in 2016. For the second year in a row the number of cartel decisions, firms prosecuted and aggregate fines have fallen; the last to the lowest level this decade and to less than a quarter of the total fines levied in 2015. Our April Casenote critically assesses the award of interest on antitrust damages by the courts in England and Wales. It reviews the cases and shows the impact of different interest rates and methods of calculation on the total compensation of claimants. Case’s annual review of the European Commission’s cartel enforcement activities shows a shows a considerable slowdown in the Commission’s enforcement activities and a focus on smaller less harmful cartels. Our March Casenote exposes the way the new European Damages Directive (2014/104/EU) goes out of its way to avoid the possibility that pass-on may unjustly enrich claimants, while ignoring the lost volume damages that accompany pass-on. As a result purchasers will be under-compensated. The Casenote proposes that defendants who raise the pass-on defence be liable for lost volume damages, and that they provide estimates of the lost sales implicit in their estimates of pass-on. In June the Competition Authority settled its case with the Irish Medical Organisation (IMO). Since 2006 the Competition Authority has prohibited the IMO and the Minister of Health from discussing fees paid to GPs to provide free general medical services to public patients. This emasculated the IMO as a registered trade union in representing its members, and left the Minister as the sole purchaser of GP services for public patients with the power to unilaterally set fees. This application of the Irish Competition Act 2002 was seen as inimical to good labour relations and to the smooth running of the public health scheme. As a reaction to the Irish Government’s third successive reduction in fees, the IMO “suggested” to its members that they refuse to supply services which it claimed had hitherto been provided pro bono. Our May Casenote Efficient cartel – Oxymoron or economic insight? argues that the war against cartels may be overlooking their beneficial effects in some industries. Industries with empty cores, environmental problems, where coordination reduces marginal costs and even export cartels may increase efficiency and challenge the claim that cartels that increase prices and reduce output are anti-competitive. Our August Casenote Price wars and cartel damages looks at the different reasons for price wars and how they affect the quantification of overcharges, the but for price, and the duration of a cartel. To illustrate the analysis the European Commission’s amino acid (lysine) decision and several empirical studies of overcharges for the German cement cartel are used.